Imagine your new custom home nestled on 145 picturesque prime acres on a meandering country road in Prince Edward County. Prime producing farm land with gently rolling fields, approx. 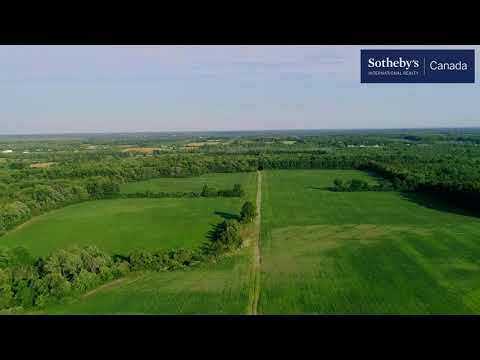 100 acres workable land (currently with soy beans), cedar rail fencing, pond, mixed woodland, gravel lane to back fields, a perfect setting for a new custom residence, in neighbourhood of horse farms, a stone century home and vineyard …a totally bucolic setting and lifestyle awaits…. build your dream home, work the farm or simply enjoy your country retreat. Engage in all the charms of “The County” from its abundant vineyards and wineries, fine and casual dining, arts trail, Sandbanks beaches, trendy small towns, and year round splendour! Well located for easy commuting to the GTA, this wonderful estate acreage is the perfect backdrop to your new estate residence or retreat from the city!